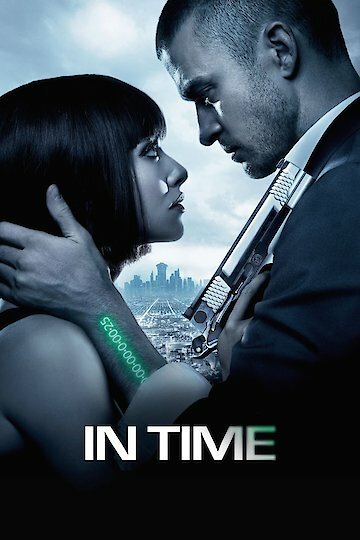 The movie In Time is a futuristic drama starring Justin Timberlake and Amanda Seyfried. The setting of the movie is a future time in which the only currency is time. Every person is equipped with a running clock on their wrist and when the time on that wrist runs out they die. However, the great twist is that they must give up that time in order to pay for goods and services, and so not only does time disappear throughout the course of the day, every time they purchase something they get a little closer to death and must find a way to acquire more time to continue to survive. Much like today's world, there is a rich class of people, who have literally all the time in the world, and a poor class of people, who live day to day acquiring just enough time to make it to the next day. Ultimately, the movie is about the relationship between these two groups of people. The story revolves around Timberlake, who is one of the world's poor people that's living day to day. Through a bit of luck he acquires a near infinite amount of time from a stranger who dies unexpectedly. Timberlake's character, Will, starts to explore the world where people are inundated with large amounts of time. While there, he meets Seyfried's character, Sylvia, who he takes a keen liking to. Will ultimately kidnaps Sylvia and the two set off with the authorities right behind them. Along the way, Sylvia begins to learn about the world that Will has lived in his entire life and the inequalities in time that exist throughout the world. While the premise of the film is odd and idiopathic, it does grow into a rather intriguing thriller. The script is far from great, but the performances of Timberlake and Seyfried, as well as the unique subject matter make In Time a movie worth seeing. In Time is currently available to watch and stream, buy on demand at Amazon, Vudu, Google Play, iTunes, YouTube VOD online. Justin Timberlake and Jessica Biel: Ready For Kids? Are Jessica and Justin ready to settle down and have some seriously attractive kids? Timberlake's grandmother answers. A wedding video shot by Timberlake's friends uses homeless people to try and be humorous. Timberlake apologizes for their actions.